Who doesn't love hot brie melted with dried cranberries and slivered almonds? I know I do. Hot melted cheese, what is better than that? We make it easy with our Bistro Brie Baker. This cute red porcelain lidded pot comes complete with the cranberries and almonds. 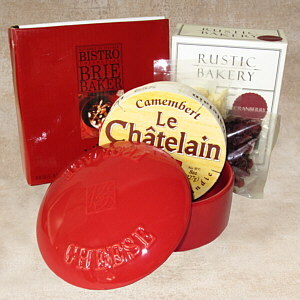 We provide the Brie or Camembert and the Crostini to scoop up all that creamy treasure once it comes out of the oven. Perfect to use again and again with jam, caramel and other toppings.